Yes, the toppings were intact. 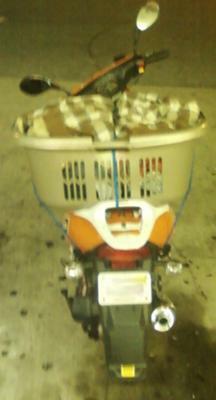 about 30lbs of wet clothes from the laundromat transported 3 miles home. 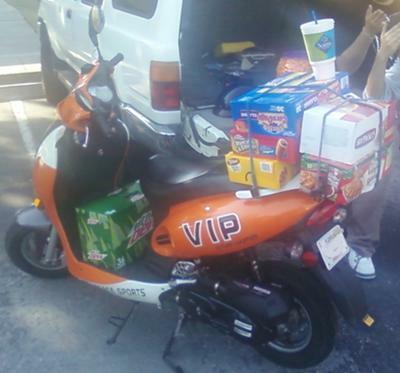 Greatest feat of all: $70 worth of food, strapped down by three bungee cords and transported nearly 10 miles. Here is my review of my 2009 Peace Sports VIP Future Champion 49cc (Bash) scooter... While there is extensive debate towards the quality of these inexpensive scooters, I have found my VIP to be a reliable scooter and will feel bad when I sell it for a motorcycle. I purchased it from a relatively new dealer literally across the street from my house for $699 with 0.2 miles on it. While I understand the risks in purchasing a scooter from a dealer with no reputation, I also understand that being the warranty was only good for 30 days both at that dealer and at other dealers, I might as well save $200 by getting it from the lowest "bidder." First impressions of it were that of skepticism. I have read and heard countless allegations of them being built with inferior parts and labor, and even metal but I have yet to see proof that these things are too cheap to be a good deal. There is a bit of a vibration noise when accelerating, but it does not seem to be a problem, and the other scoots of the same model seem to exhibit the same symptoms. There is one problem that has arisen. Within the first 250 miles I would be sitting at a light and the scooter would be lurching forward. I sent the dealer an E-Mail and he told me to stop by and get an idle adjustment (he did it for free) and it ran fine after that. Now at 1,000 miles (30 days later, lol) with the idle set to just under 1,000 rpm, it began running rough at lights and eventually downright stalled. The problem is new and from my research it may be either a bad coil or the consequence of using the kickstand on uneven ground and having it tip over while running, which would mean gas in the oil and a slow seize emerging. So in conclusion, my Bash (which is the actual manufacturer, Peace Sports being the importer) has been a solid ride that can hold its own in a town where people race to the next stoplight. I've developed little difference in my routes from my cycle commuting days, and it is a definite plus to not arrive to class sweaty. There is ample under-seat storage to hold my flashlight, some tools, rags, and my helmet when not in use. However, I did remove the rear storage container to free up room for oversize objects and even a passenger weighing 250lbs (I weigh 240, so that's 490 lbs). I will miss it, but a possible commute across the Tampa Bay, which is inaccessible by scooters and a virtual death wish by bicycle has prompted me to have to get something bigger. Hello fellow 49cc bash scooter owners, or past owners, or even future owners. I bought mine from a pawn shop for $475.00. It is a pretty reddish color and a 2010. I just love it. Ride it every day, down here in Florida for about ten miles and have not had a single problem...cranks right up and sits still at red lights and stop signs...It costs only three dollars to fill up and get wishful comments from those big truckers and SUV's. I only drive my Chevy S10 when it is raining or I want to travel more than 10 miles. I was just surprised at all the problems others seem to have. Maybe my time is around the corner. Scooter lover. I first got it, it would hesitate,go, hesitate. the gas cap has a dip to when dew or rain can seap into the gas. kept cleaning carborator, was dew.clutch went, now a tir. nt find a tire no where. need help. 2009 peace sports 49cc. where can I go. Brooksville, fl. It was slowing down to 20mph!. Apparentely it was a “flat tire”. Unbelievable! They changed the whole tire because it was kind of damaged and voila! Back to 40 - 45mph. Bought this Bash Scooter in July 2012 brand new,only had 30 miles on it when Speedometer cable broke,dealer said not covered by warranty,400 miles later frame weld broke off allowing rear tire to rub and move off center point by 8 to 10 inches.I am almost sure the dealer is going to say not covered Warranty.My advise don't buy Bash Scooters or their Peaceful Warrior Brand. This maybe just a Lemon? I got mine in febuary of this year. I have over a thousand km on it. It seems to stall while warming up and when i stop at lights or stop signs. There's a loud vibration when i accelorate. It sounds a little rough sometimes. Sometimes it only will reach 25mph. i dont know if this is normal or what please help. We just purchased one used that only had 330 mile on it. It is a 2009 bash. We had it a week and now it will not start. It tries too and then it will flood. I wonder if it just was not rode enough and the carb is in need of some repair or something. We have to take it all the way to Tampa to get it looked at for $50.00 a hour. We paid 595 for it and after all of this I hope it will not cost too much to fix it. I guess when you buy used thats what you get. After further research I see we could have bought a new one for 800. Lesson learned on used scooters. 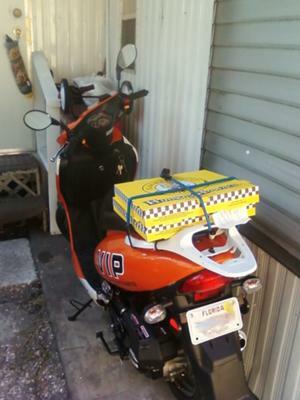 I also bought my scooter from a dealer here in Port St. Lucie, Florida. I have taken it back to the dealer twice (well within the warranty period) as the rear brake squeaks VERY loud. They tell me all scooters squeak and will not repair it. I bought mine may 2011 from a dealer in port st lucie florida not sure why i paid 1299 for the damn thing. after more research later found them for 750 with helmet and trunk, So far my issues are the battery(seemed to have exploded) and the kick start snapped completely. dealer says the kickstart could be covered but it may not. Any where to get these fixed for cheap?? I only have 100 miles on it. anyone ever have that happen or hear or it what is it? So I took apart the back end of the scooter today and was greeted by a small black spring, loose from the clutch. One of the clutch springs fell out somehow. However, not my problem any more as I am selling it. Will I buy another scoot? Someday. but for now, I am making a step towards motorcycle ownership. I am on my second VIP 8 months old and 9000 miles I use it everyday. If you like to tinker this a great scooter. I change oil every 500 miles. Utube video will show you how. 1500 miles change spark plug, clean air filter. 4000-5000 miles replace carborator. see Utube. Scooter not being used is the worst thing you can do, run it at least every other day. After writing this, I went to do more research on the exact cause and symptoms and it appears my clutch is binding. That explains why it's not cutting loose when I get down to 3,000 rpm like it used to and why the rear wheel spins while it is up on the stand. Going to take a look at it Friday to see for sure. If you keep it the time has come for a valve adjustment. Stalling and rough running are a sure sign that the exhaust valve has tightened up and is in need of more clearance.